The drive from DeGrey River to Port Hedland was a very short trip indeed. This time we are staying in a caravan park with SHOWERS - yeah. Once Myrtle was all set up we both dashed for the showers, oh so nice. 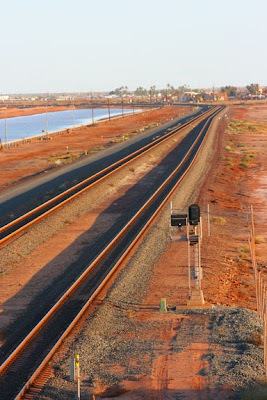 Port Hedland is a very industrial town with a population of approx. 22,000, including the satellite town of South Hedland, 18 kms away. Port Hedland has a natural deep anchorage harbour which perfectly accommodates the many huge tanker ships that arrived, load up with Iron Ore and then leave to various parts of the world. The Iron Ore comes from mines further inland, one such town being Newman. The Iron Ore is loaded onto trains - very long trains - and travel the 400km plus rail journey to Port Hedland for shipping. I watched and counted as one train arrived, it had 2 Engines then 123 carriages, then 3 engines and then another 124 carriages. But they can get up to 320 carriages! Other major industries in the town include offshore natural gas fields, manganese, livestock and salt. The salt production is amazing, I actually stalked a salt truck today. I went to the salt mountain at the entrance of Port Hedland and watched the three trailers get loaded with the snow white salt. Then I followed him down the highway into the Port of Port Hedland where the salt was dumped and picked up by huge conveyor belts and dropped onto what looked like a snowfield. 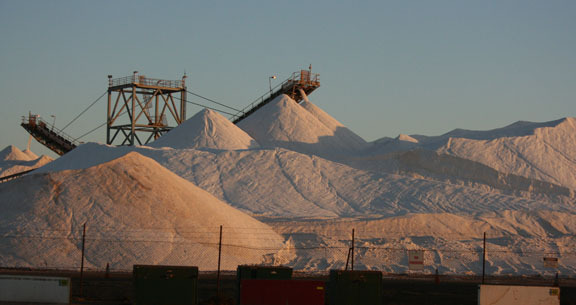 I found the sight of all this salt amazing.